The work of Planck and Einstein paved the way for understanding how electrons are arranged in atoms. In 1913, the Danish physicist Niels Bohr ( FIGURE 6.8) offered a theoretical explanation of line spectra, another phenomenon that had puzzled scientists during the nineteenth century. A particular source of radiant energy may emit a single wavelength, as in the light from a laser. Radiation composed of a single wavelength is monochromatic. However, most common radiation sources, including lightbulbs and stars, produce radiation containing many different wavelengths and is polychromatic. A spectrum is produced when radiation from such sources is separated into its component wavelengths, as shown in FIGURE 6.9. The resulting spectrum consists of a continuous range of colors—violet merges into indigo, indigo into blue, and so forth, with no blank spots. This rainbow of colors, containing light of all wavelengths, is called a continuous spectrum. The most familiar example of a continuous spectrum is the rainbow produced when raindrops or mist acts as a prism for sunlight. Not all radiation sources produce a continuous spectrum. When a high voltage is applied to tubes that contain different gases under reduced pressure, the gases emit different colors of light ( FIGURE 6.10). The light emitted by neon gas is the familiar red-orange glow of many “neon” lights, whereas sodium vapor emits the yellow light characteristic of some modern streetlights. When light coming from such tubes is passed through a prism, only a few wavelengths are present in the resultant spectra ( FIGURE 6.11). Each colored line in such spectra represents light of one wavelength. A spectrum containing radiation of only specific wavelengths is called a line spectrum. FIGURE 6.8 Quantum giants. 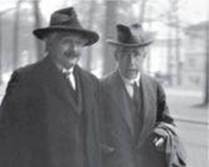 Niels Bohr (right) with Albert Einstein. Bohr (1885-1962) made major contributions to the quantum theory and was awarded the Nobel Prize in Physics in 1922. FIGURE 6.9 Creating a spectrum. A continuous visible spectrum is produced when a narrow beam of white light is passed through a prism. The white light could be sunlight or light from an incandescent lamp. 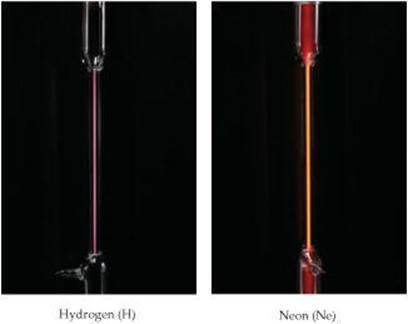 FIGURE 6.10 Atomic emission of hydrogen and neon. Different gases emit light of different characteristic colors when an electric current is passed through them. FIGURE 6.11 Line spectra of hydrogen and neon. In this formula λ is the wavelength of a spectral line, RH is the Rydberg constant (1.096776 × 107 m–1), and n1 and n2 are positive integers, with n2 being larger than n1. How could the remarkable simplicity of this equation be explained? It took nearly 30 more years to answer this question. To explain the line spectrum of hydrogen, Bohr assumed that electrons in hydrogen atoms move in circular orbits around the nucleus, but this assumption posed a problem. According to classical physics, a charged particle (such as an electron) moving in a circular path should continuously lose energy. As an electron loses energy, therefore, it should spiral into the positively charged nucleus. This behavior, however, does not happen—hydrogen atoms are stable. So how can we explain this apparent violation of the laws of physics? Bohr approached this problem in much the same way that Planck had approached the problem of the nature of the radiation emitted by hot objects: He assumed that the prevailing laws of physics were inadequate to describe all aspects of atoms. Furthermore, he adopted Planck's idea that energies are quantized. 1. Only orbits of certain radii, corresponding to certain specific energies, are permitted for the electron in a hydrogen atom. 2. An electron in a permitted orbit is in an “allowed” energy state. An electron in an allowed energy state does not radiate energy and, therefore, does not spiral into the nucleus. 3. Energy is emitted or absorbed by the electron only as the electron changes from one allowed energy state to another. This energy is emitted or absorbed as a photon that has energy E = hv. Before reading further about Bohr's model, speculate as to how it explains the fact that hydrogen gas emits a line spectrum (Figure 6.11) rather than a continuous spectrum. where h, c, and RH are Planck's constant, the speed of light, and the Rydberg constant, respectively. The integer n, which can have whole-number values of 1, 2, 3,...∞, is called the principal quantum number. Each orbit corresponds to a different value of n, and the radius of the orbit gets larger as n increases. Thus, the first allowed orbit (the one closest to the nucleus) has n = 1, the next allowed orbit (the one second closest to the nucleus) has n = 2, and so forth. The electron in the hydrogen atom can be in any allowed orbit, and Equation 6.5 tells us the energy the electron has in each allowed orbit. Note that the energies of the electron given by Equation 6.5 are negative for all values of n. The lower (more negative) the energy is, the more stable the atom is. The energy is lowest (most negative) for n = 1. As n gets larger, the energy becomes less negative and therefore increases. We can liken the situation to a ladder in which the rungs are numbered from the bottom. The higher one climbs (the greater the value of n), the higher the energy. The lowest-energy state (n = 1, analogous to the bottom rung) is called the ground state of the atom. 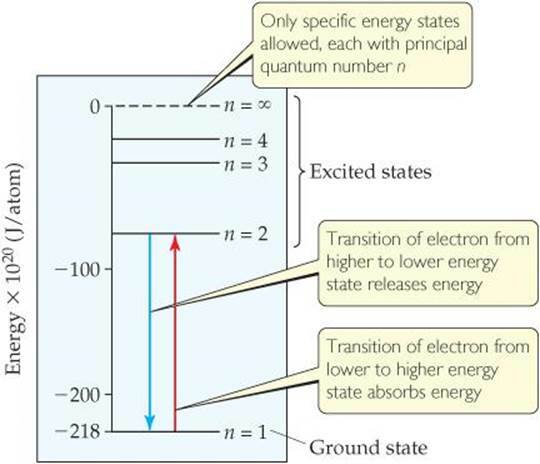 When the electron is in a higher-energy state (n = 2 or higher), the atom is said to be in an excited state. FIGURE 6.12 shows the energy of the electron in a hydrogen atom for several values of n.
If the transition of an electron from the n = 3 state to the n = 2 state results in emission of visible light, is the transition from the n = 2 state to the n = 1 state more likely to result in the emission of infrared or ultraviolet radiation? FIGURE 6.12 Energy states in the hydrogen atom. Only states for n = 1 through n = 4 and n = ∞ are shown. Energy is released or absorbed when an electron moves from one energy state to another. The state in which the electron is removed from the nucleus is called the reference, or zero-energy, state of the hydrogen atom. In his third postulate, Bohr assumed that the electron can “jump” from one allowed orbit to another by either absorbing or emitting photons whose radiant energy corresponds exactly to the energy difference between the two orbits. The electron must absorb energy in order to move to a higher-energy state (higher value of n). Conversely, radiant energy is emitted when the electron jumps to a lower-energy state (lower value of n). Bohr's model of the hydrogen atom states, therefore, that only the specific frequencies of light that satisfy Equation 6.6 can be absorbed or emitted by the atom. We have not included the negative sign of the energy in this calculation because wavelength and frequency are always reported as positive quantities. The direction of energy flow is indicated by saying that a photon of wavelength 1.02 × 10–7 m has been emitted. Thus, the existence of discrete spectral lines can be attributed to the quantized jumps of electrons between energy levels. As the electron in a hydrogen atom jumps from the n = 3 orbit to the n = 7 orbit, does it absorb energy or emit energy? Using Figure 6.12, predict which of these electronic transitions produces the spectral line having the longest wavelength: n = 2 to n = 1, n = 3 to n = 2, or n = 4 to n = 3. The wavelength increases as frequency decreases (λ = c/v). Hence, the longest wavelength will be associated with the lowest frequency. According to Planck's equation, E = hv, the lowest frequency is associated with the lowest energy. In Figure 6.12 the energy levels (horizontal lines) that are closest together represents the smallest energy change. Thus, the n = 4 to n = 3 transition produces the longest wavelength (lowest frequency) line. Indicate whether each of the following electronic transitions emits energy or requires the absorption of energy: (a) n = 3 to n = 1; (b) n = 2 to n = 4. 1. Electrons exist only in certain discrete energy levels, which are described by quantum numbers. 2. Energy is involved in the transition of an electron from one level to another. We will now start to develop the successor to the Bohr model, which requires that we take a closer look at the behavior of matter.